I have posted before on the "Londonderry Vision" and Captain Coppin, but new interest in the subject -- along with some thought-provoking research by the indefatigable Ralph Lloyd-Jones, makes it worth a second go. 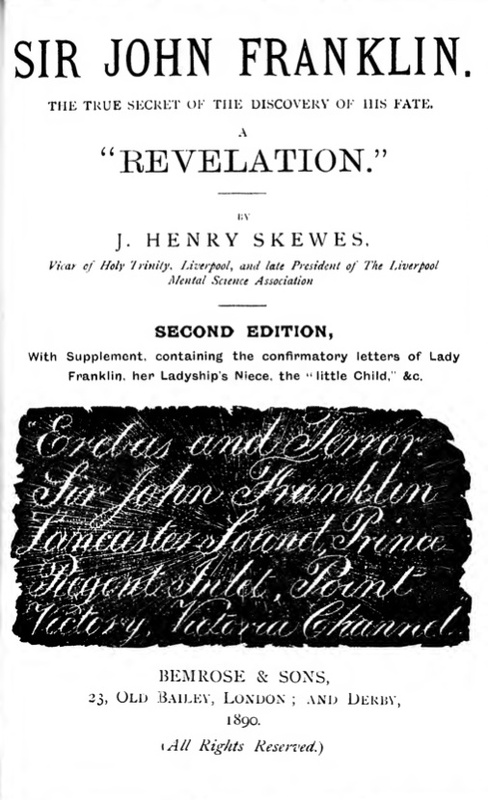 We are also fortunate in that both the first and second editions of the Rev. 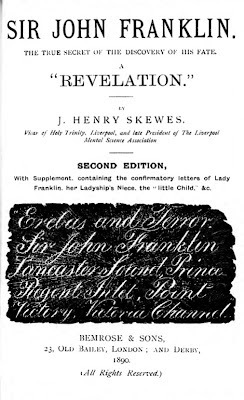 J. Henry Skewes's Revelation are now available online at archive.org for anyone to download or read (the book is exceedingly scarce -- only a handful of copies are in libraries, and it rarely comes up for sale). All this makes a fresh look at the story worthwhile, and opens it up the historical evidence to scrutiny by the wisdom of crowds. The basic facts are simple enough: In 1849, Captain William Coppin -- a comfortably well-off shipyard owner in Belfast -- heard from his family of strange visions in which his recently-deceased youngest daughter Louisa -- known to the family as "Weesy" -- appeared to her siblings and offered revelations on various subjects. The family became convinced of their truth after the child's ghost predicted the death of the family banker, and the children -- as the mystery of Sir John Franklin's fate was much in the air -- asked their spiritual sibling whether she had any intelligence as to his whereabouts. "Weesy" readily replied with a vision of his ships in icy waters, along with a map and some letters upon the wall. When Mrs. Coppin, on one of her husband's apparently infrequent visits to the family home, related this story to him, he decided -- after some delay -- that he should inform Lady Franklin of the particulars, and bring her a chart drawn by Weesy's sister Anne from the one which had appeared on the wall. They corresponded, met, and it appears that Jane may well have passed on some of the advice apparently contained in these revelations to officers then preparing to leave for the Arctic to search for her husband. It is at this point that we enter into uncertainty, as most of the claims that the Reverend Skewes published in 1889 in his book about the affair cannot now be independently substantiated. The first suspicion that we might have, sensibly enough, would be that Skewes altered or fabricated evidence to make the Coppin story more accurate than in fact it was. 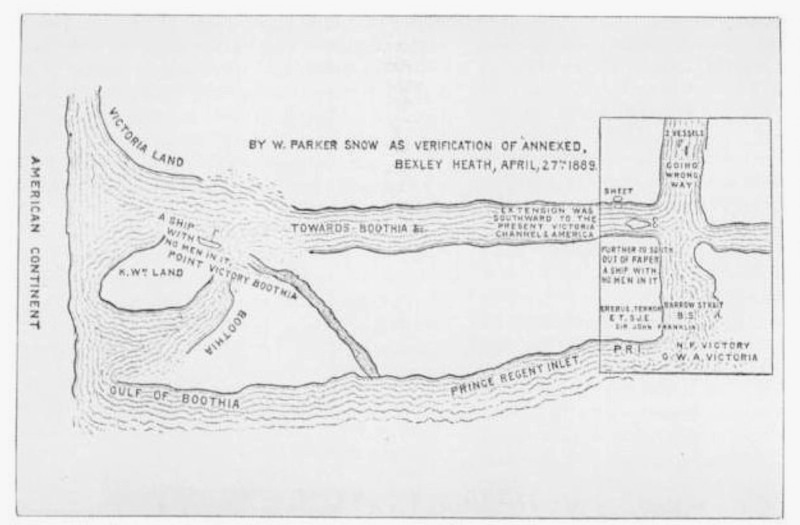 Such a possibility can't be entirely ruled out, absent any letters from the period, or the chart itself -- but as Lloyd-Jones observes in his recent article on the subject in the Polar Record, there is good reason to believe that the reason these materials are missing is that Sophia Cracroft retained, and probably destroyed them. "I have received your letter of yesterday, requesting you to tell me how far the 'mysterious revelations' of your child, in 1850, respecting the expedition of my late husband, correspond with the facts recently ascertained by Captain McClintock's researches. In reply, I have no hesitation in telling you that your child's drawn by herself, without as you assure me having seen an Arctic chart before, represented the ships as being in a channel which we believed at that time to be inaccessible, but which has since been found ... I have carefully preserved your letter and the child's drawing and you may be assured they are in safety." There is, I think, no reason to doubt the authenticity of this letter, and it suggests not only that Lady Franklin took an interest in the original revelation, but eagerly noted that the subsequent discovery of the Bellot Strait -- via which McClintock had reached King William Island -- was exactly in correspondence with the map (she did not, it should be observed, note the map's error, in showing the Gulf of Boothia connecting with the waters south of King William Island -- an error which it shared with Arrowsmith's charts of 1844, which Franklin would have relied on). As Lloyd-Jones has it, her Ladyship's willingness to try any and all means -- psychics included -- was nothing but admirable, though it certainly went against the religious feeling of many, and was a departure from the previous views of herself as well as Sophia. By 1889, after Jane's death, Sophia and Sir Leopold doubtless felt that the whole thing might reflect poorly on Jane's posthumous reputation, and were willing to deny a story that -- so far as they thought -- was only known within private circles. They had not, alas, reckoned on the limitless haughty enthusiasm of Skewes. But what of the revelation itself? There's a second post to be had on that (which will follow soon enough), but for now suffice it to say that, if the child's chart is somewhat cryptic, the "writing on the wall" -- a series of initialisms open to the possibility of standing for any number of things -- is another story altogether. Fascinating! Ralph Lloyd-Jones does it again! The very strange part is that "the vision" of the whereabouts of Franklin was close to the truth, wasn't it? The Skewes went through two editions, as I have owned both.